Open Wed.-Sat. 5 p.m.-10 p.m., Sun. 1 p.m.-7:30 p.m.
About the restaurant: Blue Hill at Stone Barns strikes a fine balance between traditional charm and modern amenities, an archetype. A working farm, education center, and bar and restaurant, it is truly unique. Blue Hill has the pedigree, located within Stone Barns Center for Food & Agriculture, once part of the Rockefeller estate. It has the concept; much of the food served in the restaurant comes straight from the grounds, as well as other local farms. And it has the working, experimental culinary activist in Dan Barber. The result is impossibly fresh tasting fare with little complication. 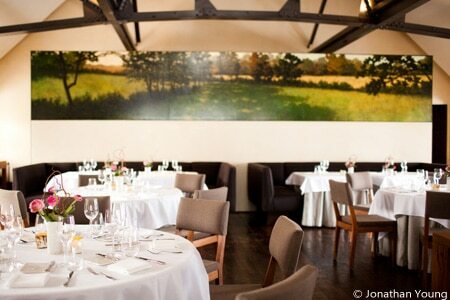 In addition to the main dining room, there's a private dining room overlooking the herb garden. About the food: Don't expect to be handed a traditional menu. Rather, guests are served a multi-course tasting menu ($258 per guest, exclusive of beverage pairings, tax and 20% administrative fee in place of gratuity). Dishes are devised daily according to the harvest. Diners at different tables on any given evening are advised of the menu according to the day's yields. Therefore, supplies of any ingredient can be limited. But one thing is guaranteed. Whatever comes out of the kitchen will be prepared meticulously and with invention. Sweet endings often feature fresh fruit from the farm. About the wine: The wine list pays homage to the products of the Hudson Valley, the Old World and the New World. Sure, this place has presence, commanding beauty and fantastic cuisine, but what lingers is Barber's enthusiasm for reaching beyond "farm to table," and broadening its impact.